All of our summer residents have arrived and are beginning to start the cycle of raising another generation of their own species. These last arrivals include swallows, hummingbirds, warblers, wrens and Chipping Sparrows to name a few. These latecomers arrive at approximately the same time as the trees go into full leaf. All a birder has to do is to watch for the leaves and then the birds themselves. At the same time, all the spring transients have left for the far north to start their breeding cycle. 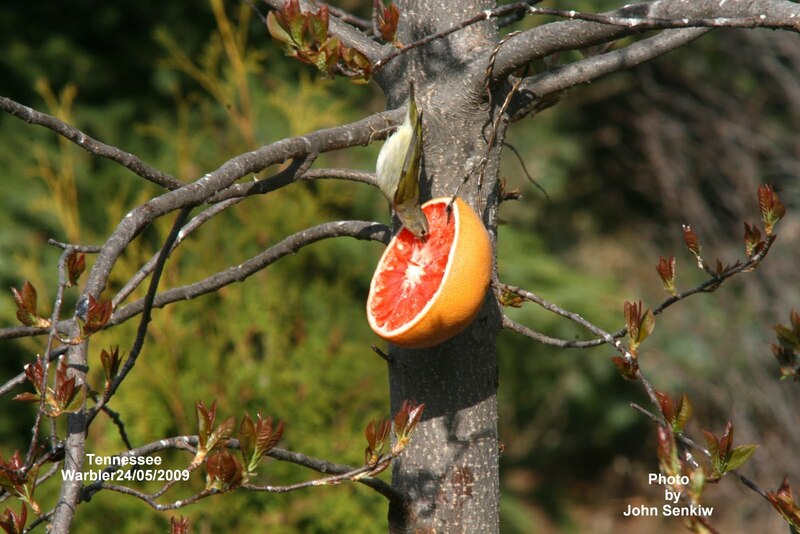 This week I am writing the second last article ("penultimate" for you word lovers) in a series of discussions about attracting birds to one's yard by providing food and water. I have written about feeders for seeds, nuts, peanut butter, suet and so on; many of which require some effort to put up. At this time of year, once the frosts are over, sugar based foods can be offered. (It is a good thing birds do not have teeth or else dentists would get excited). The feeders and the food are probably the cheapest and easiest to maintain. There are three general or common kinds of sugar based bird food: 1). citrus fruit, 2). grape jelly, 3). sugar water (nectar). First, citrus (grapefruit and oranges only) are the easiest to prepare and set out. Simply cut the fruit at the equator and set the halves out on a piece of broken branch so that the fruit is positioned at about the same angle as a satellite dish. If there are no suitable broken branches, then drive a nail (large headed is best) into a branch and hang it on that. The nail can be pulled out later with no damage to the tree. Second, grape jelly can be put out in a small tin (tuna fish tin is almost perfect) in a tree secured with wire to provide stability. A word of caution here: use jelly, as in jam, and not the rubbery fruit flavoured dessert that little kids love. The dessert will not work. Both citrus and jelly need to be offered for only several weeks in the spring and right now is the perfect time to do so. After that the birds quit coming and the food becomes an attraction for insects, particularly ants. Third, sugar water or nectar is familiar to just about everybody. All sorts of feeders are available commercially and some can even be made at home. Commercially prepared nectar can be purchased at stores or made at home much more cheaply by simply dissolving one part sugar into four parts water and bringing to a boil. Boiling does not change the sugar but it does cause the nectar to become clear and the solution seems to last longer without the sugar settling out. Sugar water always reminds me of an incident that occurred in Saskatoon in one of the large box stores. A couple came up to me and asked if I knew where the hummingbird food was. Knowing that it was sold out, I informed them so, and then, to be helpful I suggested they make their own as I have just outlined. My mistake. The gentleman gave me a very stern lecture about the evils of sugar and that my concoction would cause great harm to the birds and that I should use only commercially prepared product. I did not reply as I did not think that pointing out to him that the sugar that one buys (white, dark or hummingbird mix), sugar in a beet or cane, sugar in a beehive or sugar in a flower is all the same - sucrose. (Citrus provides a fruit sugar called fructose). I went home and made my own. Which birds can be attracted to what? 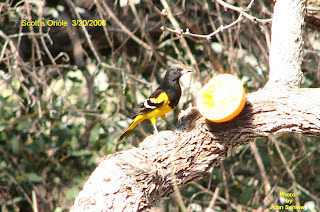 Various warblers, especially Orange Crowned and Tennessee Warblers, orioles and some woodpeckers are attracted to citrus. Tennessee Warblers, but especially orioles, are readily attracted to grape jelly. As of this writing none of the aforementioned birds have come to my feeders this spring, yet. Here's hoping. 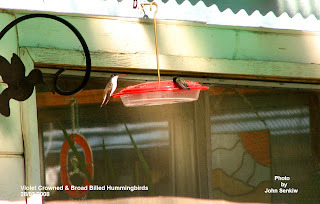 The nectar feeders are really designed for hummingbirds only. Older models were not selective enough and larger birds like orioles would help themselves draining a feeder quite quickly. Newer models come with a weight sensitive perch that behaves like a teeter totter. The very light hummingbirds do not cause the perch to go down, but the larger birds do, causing a trap door to close off the nectar thus preventing them from drinking. Incidentally, larger versions of hummingbird feeders especially for orioles are available. Insects are a problem with sugar feeders. Wasps, bees and flies do not seem to be too much of a problem as the birds simple chase them away and then feed. Ants are another matter. They come in such large numbers that birds get discouraged. Citrus and jelly might have to be moved around thus delaying ant infestation. Hummingbird feeders now come with an ant barrier. Midway between the feeder and the point where the feeder is suspended a small pan of water is placed. Ants will not cross water so cannot get to the feeder. These commercially prepared ant barriers are simple in design, cheap and effective. 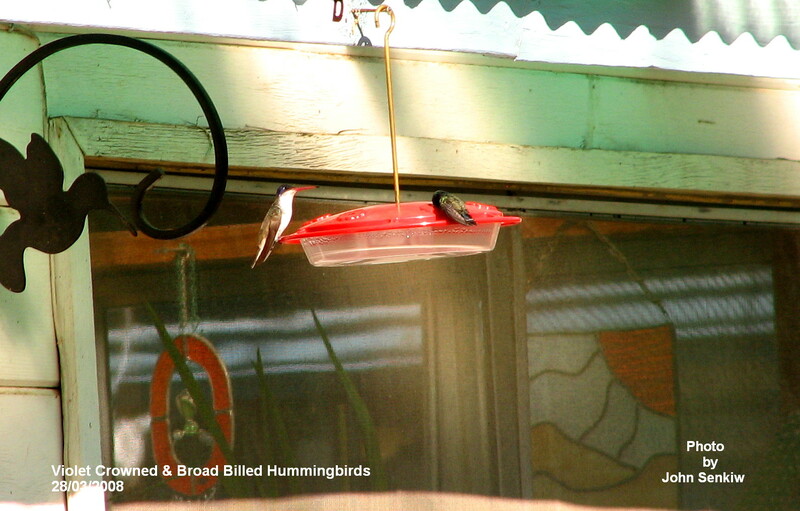 Every hummingbird feeder should have one. This week's photos are of a Tennessee Warbler feeding on half a grapefruit in our backyard; A rare Violet Crowned Hummingbird (white belly) and the common Broad Billed Hummingbird at a feeder in southern Arizona; and a Scot's Oriole sizing up a grapefruit in southern Arizona. The Scot's Oriole really did favour the grape jelly, but I did not get a shot of that. Our local orioles and hummingbirds will do the same. With the cold, wet and snowy weather that we have been having lately it is a wonder that any more birds have arrived at all, but they have. Purple Martins, Ruby Crowned Kinglets, Goldfinches, Mourning Doves, Ring Billed Gulls and Franklin's Gulls are just to name a few. Of all the birds listed, only the Purple Martins would have difficulty getting through this last week of snow and rain. Purple Martins feed solely on flying insects that are caught in flight. Because there are no flying insects out right now, I have no idea what the Martins do to survive. Do they temporarily move some place warmer? Do they actually go out and eat something else? Perhaps, they go into a kind of temporary hibernation or torpor which would allow them to last a long time with very little food requirements as some birds and animals do? However, survive they do. This would be a good topic for those inclined to research such things. 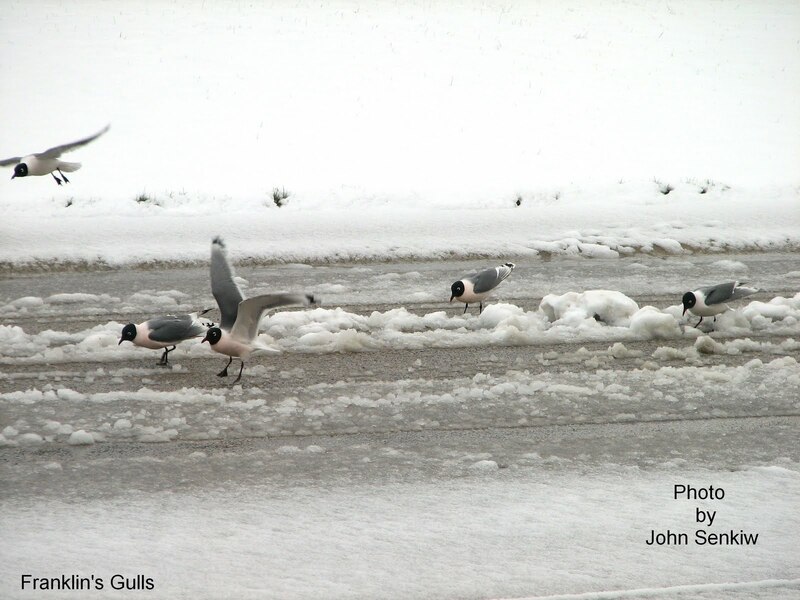 Gulls landed on the street in front of our house and proceeded to "sweep" the area clean. However, there was a problem. The birds at the back of the flock would have only "leftovers" from the birds at the front. To make sure every bird got its fair share the birds at the back would periodically fly to the front of the line for good pickings. A good system and quite interesting to watch. 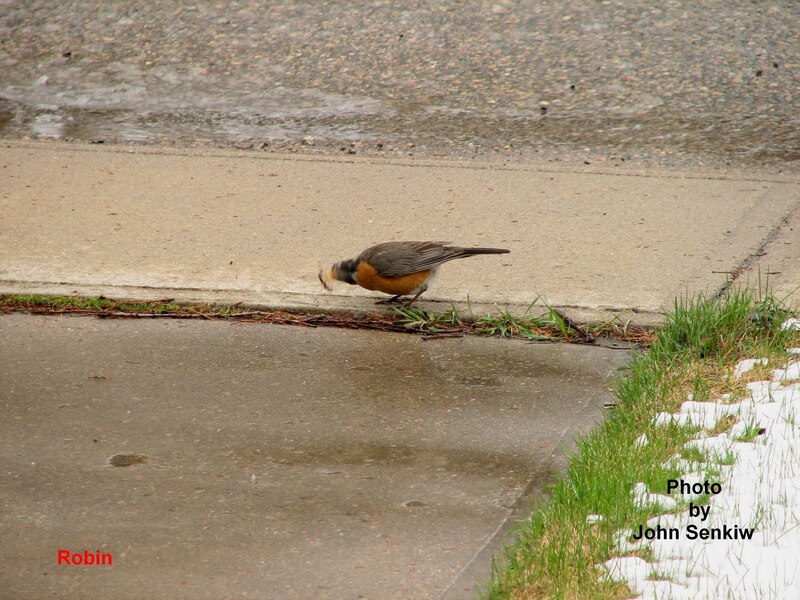 Not only do birds survive bad weather, but some are well into nest building. House Sparrows and Grackles are continually picking up nesting material and hauling it to their chosen sites. The Grackles are building their nest in a spruce tree in our neighbour's yard; the sparrows are building theirs in a birdhouse in our yard. One day I was particularly amused by a male House Sparrow trying to get a two foot strip of plastic to the birdhouse. The drag caused by so large an object forced the sparrow to expend a great deal of time and energy. Its flight was slow and laboured, but eventually it succeeded. Why this sparrow would want this strip is beyond me. 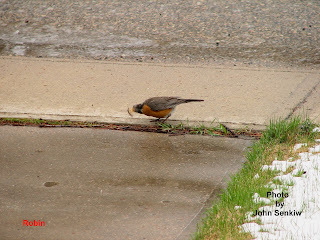 This week's photos show a Robin picking up earthworms on the edge of our driveway. Its head is blurred because it was shaking the worm as I snapped the picture. 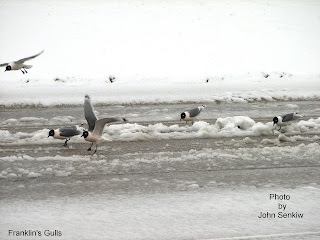 The other photo is of a small flock of Franklin's Gulls feeding on the snowy street in front of our house.